Specific Sports Shoes… Are they needed? It’s that time of year again where sports seasons are about to start and our children need new shoes. They may be starting a new sport, have had a massive growth spurt or maybe just entering that next level and want to be more specific in what they want to wear. Either way it can get very confusing with everything that’s available. On the market there are tennis shoes, netball shoes, basket ball shoes, hockey shoes, trail shoes, running shoes, soccer boots, rugby boots and the list goes on. But do we really need a specific shoe for each specific sport? In short the answer is NO. It is still important that we are adequately supporting the feet when participating in these sorts of activities as having the correct shoe will increase longevity, decrease the risk of injury and provide the right support for your child. That being said you don’t NEED a different pair of shoes for each different sport, instead we will break it down into 3 categories for you. Traditionally running shoes are designed for forwards backwards movement on most surfaces. They are lightweight and provide lots of cushioning for those little active feet. This makes sports like running, cross-country and most grass sports. 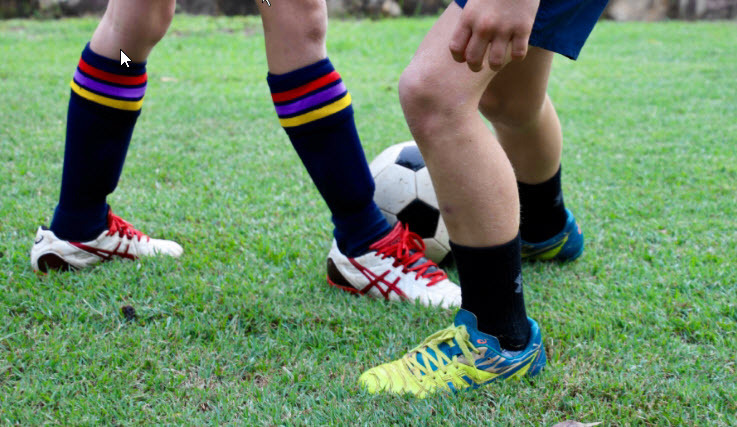 While a lot of younger players will also wear these shoes for sports such as Rugby League and Soccer these shoes were not specifically made for this and therefore it may contribute to accelerated wear. Cross training means a lot of different things to different people. Cross training shoes in this case mean shoes that are designed for side to side movement. Typically these shoes have leather uppers and a different sole unit with a more durable rubber. So sports like netball, volleyball, tennis, basketball etc. are played best in these sorts of shoes. Now there are specific shoes on the market for each of these sports however for our young players who are playing lots of different sorts these shoes are the best multi-purpose shoe. Running and cross-country can still be performed in these shoes however you will find they are slightly heavier and not as flexible. Sports such as Hockey, Touch, League, Union, Soccer etc. are all sports that require a bit more grip. For all sports you need quick sharp movements on the grass that a running shoe just can’t supply. Trail shoes are a great option when playing sports like hockey and touch. They feel like a running shoe but have more grip on the sole. League, Union and Soccer (Touch can also be included here) are all best played in a football boot due to the studs on the bottom and the increased durability of the upper. For more information on sport specific shoes keep an eye on our blog we will be bringing regular installments over the year covering these topics. The three biggest mistakes when buying football boots! ← Is your child hitting their developmental milestones?